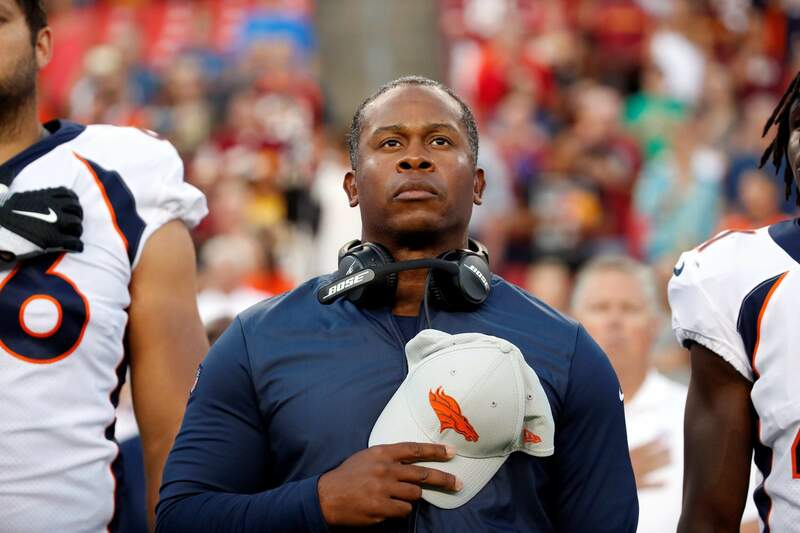 Denver Broncos head coach Vance Joseph will feel the pressure in his second year leading the Broncos. SEAHAWKS OFFENSE: OVERALL (15), RUSH (23), PASS (14). SEAHAWKS DEFENSE: OVERALL (11), RUSH (19), PASS (6). BRONCOS OFFENSE : OVERALL (17), RUSH (12), PASS (20). BRONCOS DEFENSE : OVERALL (3), RUSH (5), PASS (4). STREAKS, STATS AND NOTES: Seattle QB Russell Wilson’s 34 TD passes led league in ’17, including NFL-record 19 in fourth quarter. ... Wilson is fourth NFL player with 3,000 yards in each of first six seasons. ... S Earl Thomas ended holdout midweek after Seahawks rebuffed his request for new contract or trade. ... WR Doug Baldwin’s 29 TD catches second most in NFL since ’15. ... Tyler Lockett led league with 949 kick return yards. ... WR Brandon Marshall second among active players with 959 catches, 12,215 yards and third in TD receptions (82). ... Marshall’s first four seasons were in Denver (2006-09), only has played against Broncos once, in 2011. ... LB Bobby Wagner ranked third in NFC with 133 tackles, franchise-record sixth season with 100-plus stops. His 776 tackles were second most in league since ’12. ... CB Shaquill Griffin’s 14 pass breakups fourth most among rookies in ’17. Brother Shaquem, who has no left hand, will start at linebacker in first NFL game. ... Broncos own longest active streak in NFL with six consecutive wins in openers. ... QB Case Keenum set career highs in ’17 with Vikings in completions (325), passing yards (3,547), TD throws (22). His 67.6 completion percentage ranked second in league. ... Rookie Royce Freeman set to become first rookie RB to start for Denver since Hall of Famer Terrell Davis in ’95. Freeman’s all-time Pac-12 leader in TD runs (60). ... WR Demaryius Thomas only player in NFL with 80-plus catches and 900-plus yards each of last six seasons. ... WR Emmanuel Sanders had 11 catches for 149 yards in last meeting. ... LB Von Miller third player since ’82 (Reggie White, DeMarcus Ware) with 10-plus sacks in six of first seven seasons. Miller leads league with 83½ sacks since ‘11. ... LB Brandon Marshall coming off third 100-tackle season. ... Chris Harris Jr. one of three CBs in NFL with 400-plus tackles and 15-plus interceptions since rookie season in ’11. ... Rookie pass rusher Bradley Chubb set North Carolina State records with 60 tackles for loss and 26 sacks. Broncos drafted him fifth overall ... Fantasy tip: Sanders looks for a monster season with Keenum at QB and should test revamped Seattle secondary.